Bonnie's Blog: 3D design for K-12 and beyond: My New Book! Well it's not new to me, since I worked on it for several months last summer and fall. But today is the book's official release date, though it's been available on Amazon for a few days now. 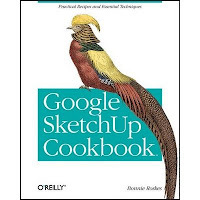 The Google SketchUp Cookbook is published by O'Reilly Media, who publish all sorts of tech-related materials. This is my first effort with a "real" publisher; until now I've only self-published (which of course I continue to do). It's quite a different experience, working with a whole team of editors, graphic artists, proofreaders, marketers, etc. It's printed in full color! The starter models can all be found in the 3D Warehouse, and, in most cases, finished models as well. Some of these finished models have scene tabs so you can click through the model's progression. If you buy a copy and enjoy it, please post a review on Amazon! I know I base my own Amazon purchases on customer reviews, and I assume most people do the same. Anyone can create anything in 3D! www.3dvinci.net.